For more information, Davis Reading Program for Young Learners Program Standards. What is the cost? My grandson is 8 almost 9. Does he still complete the beginner program.? Hi, my child is 7 this year and turning 8 next year. Should i get the young learner kit or Mastery home kit? Young Learner kit, definitely. You don’t want to skip ahead in the age range– it would only lead to frustration for your son. So start with the kit for his age range now. See how things go. Working with the kit, following the manual, should seem fun and easy for your son. He can progress at whatever pace he is comfortable with. 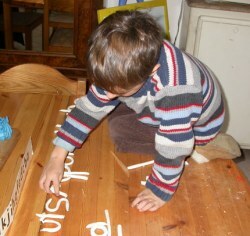 You have the same dictionary and word list to work with that you would have with the kit for an older child, but the Young Learner’s manual gives you a more flexible approach and a lot more ideas of variations on activities, as it is geared to the shorter attention span of younger children. But all the material is there to allow him to end up at the same place. Hi, currently there’s no licensed facilitator in Singapore. If I were to purchase the Young Learner Kit and teach my 6 years old by my own, would it still be as effective? Is there a step by step explanation in the kit for parents to teach the child at home? 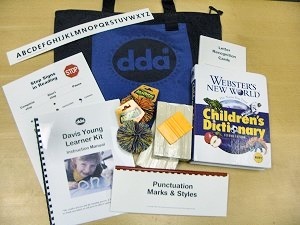 Yes, the Davis Young Learner’s Kit for Home Use comes with a manual that explains how to teach Davis tools such as focus and dial-setting, and includes a large number of suggested activities to accompany the clay modeling of letters and words. It is the same kit and manual that you would be given if there was a facilitator available to guide you throughthe program steps.